wow, out of all the things we are announcing this conference, this is my favorite, why? well because for people who know me, iv’e been heavily involved in the VMware SRM community as both an implementation specialist and now as a TC, SRM has always been my pet hobby, the fact you can simplify DR etc` was never an easy task before SRM came out but it always lack one feature which is a true data center mobility features, yes, you can shut down your vm’s at the protected site and then restart them on the recovery site but what happens when you want to fully test them AND you’ve got some physical hardware at the remote site, the “bubble” network will only be good for the “bubble” environment..anyway, then we (EMC) came with VPLEX and created the first TRUE Read/Write solutions on both sides of the sites, we heavily relied on VMware HA (FDM) but as always, nothing is perfect and HA isn’t (currently..) site aware..
TODAY, we are announcing an integration between the two, but let’s first take a step back..
VPLEX enables you to have the exact same information in two separate locations and accessible simultaneously from both locations. EMC calls this a distributed storage cluster. VPLEX is the only technology available today that offers this kind of functionality. The fact that information is simultaneously accessible is key. Many products offer remote replication, but the data at the secondary site cannot be used at the secondary site simultaneously by the same application. VPLEX offers AccessAnywhere capabilities not found in other technologies. This is all accomplished through a cache coherency model that tracks and records writes dynamically over distance. VPLEX aims to increase application availability to a point that for some applications you could enable zero downtime even in the event of losing a datacenter. VPLEX is a storage platform that enables federation across heterogeneous storage elements, both EMC and non-EMC block storage arrays. VPLEX delivers storage federation using a next-generation architecture for data mobility and information access. VPLEX itself installs in the network, in between hosts and storage, and can extend data over distance, within and between data centers—an innovation EMC refers to as Federated AccessAnywhere. 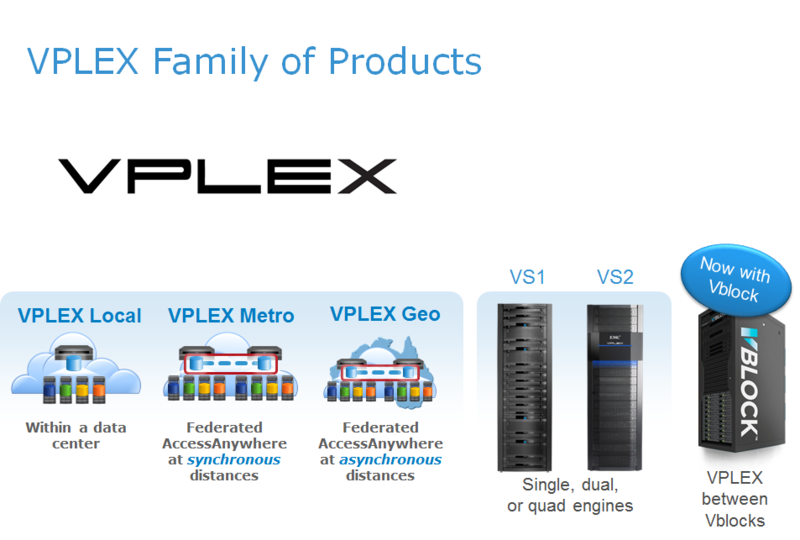 Although there are multiple products in the VPLEX family, they all have several key features in common, including cache coherency across engines in a cluster and between clusters, N+1 scaling for performance, N-1 resiliency, and an architecture that can support globalization of applications over time. VPLEX is based on groundbreaking technology that combines scale-out clustering and advanced data caching with a unique implementation of distributed cache coherence to deliver radically new and improved approaches to storage management. VPLEX is built as a cluster, and each cluster can consist of one, two, or four highly available and fully redundant enterprise engines. Each cluster, regardless of the number of engines, supports up to 8,000 virtual volumes. In fact, the reason you would add engines to a VPLEX cluster is essentially performance. As you increase the number of engines you are adding more memory, more cache, more ports, and more performance. And because VPLEX is a true cluster where all I/O is always available and can be serviced by any engine within the cluster, adding engines not only scales the cluster’s performance, but adds further resiliency as well. Although VPLEX supports up to 8,000 virtual volumes in a single cluster, when you connect two clusters together to enable distributed federation with VPLEX Metro or VPLEX Geo, each cluster can support up to 8,000 virtual volumes individually. Two clusters provide two pools of 8,000 volumes, or 16,000 in total. 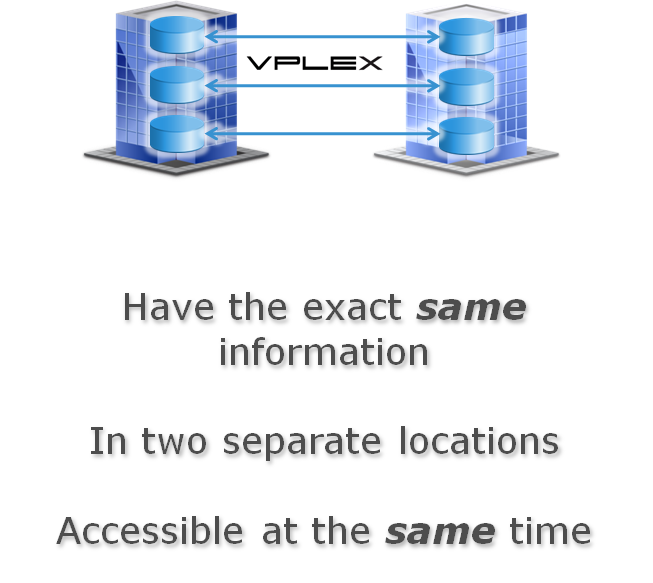 When sharing VPLEX virtual volumes between clusters, each volume is subtracted from an individual cluster’s total count. So if you were to share 8,000 distributed volumes across the two clusters, you would consume the maximum count of both clusters. So with VPLEX Metro or VPLEX Geo, you can have two independently managed pools of 8,000 volumes per cluster, for a total of 16,000, or a maximum of 8,000 shared, distributed volumes. With this capability, VPLEX delivers unique value in enabling application and data mobility, high availability, and distributed data collaboration. 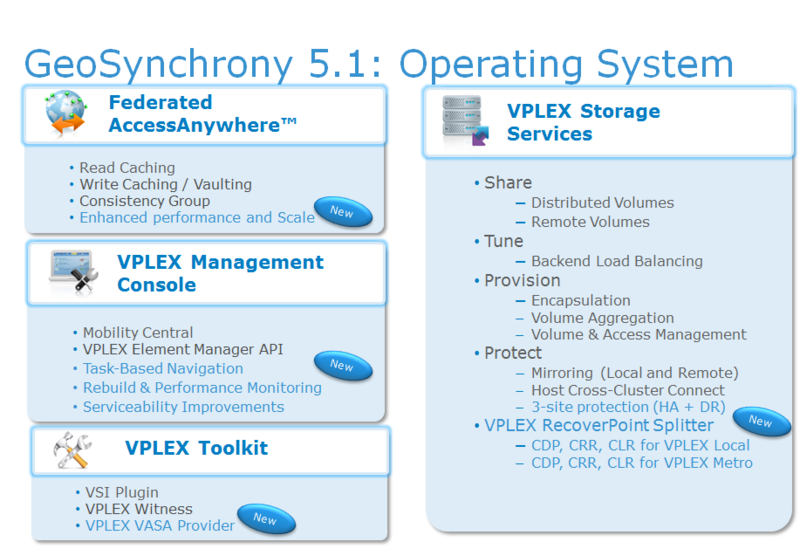 VPLEX Local is designed for use in a single data center. It allows you to federate storage arrays, simplifying data movement, providing single pane of glass management and increasing the availability of your local storage resources. VPLEX is the only storage virtualization platform that gives you get N+1 performance scaling and N-1 resiliency. VPLEX Metro extends these benefits to multiple sites. You can now transparently relocate data and applications over distance, protect your datacenter against disaster, and enable efficient collaboration between sites. All of your storage, in both datacenters can now be managed from that same single pane of glass. These use cases are enabled by VPLEX’s distributed cache architecture which allows both clusters to present the same distributed volumes to servers in both sites. All reads are serviced locally while writes are synchronously mirrored to the remote site. Not only can you mirror your data to a second site, but you can access it there, at near local speeds. VPLEX Geo is a new VPLEX family member, available for the first time with GeoSynchrony 5.0. It brings these benefits to datacenters at asynchronous distances up to 50ms. The same benefits of transparent application relocation, increased resiliency, efficient collaboration and simplified management are available. VS2 delivers twice the performance, uses half as much power, and it is more compact. VS2 is also field rackable for customers wanting to use their own standard racks. And now you can use VPLEX for data mobility and availability between Vblocks. Non-disruptive upgrade from VS1 to VS2. 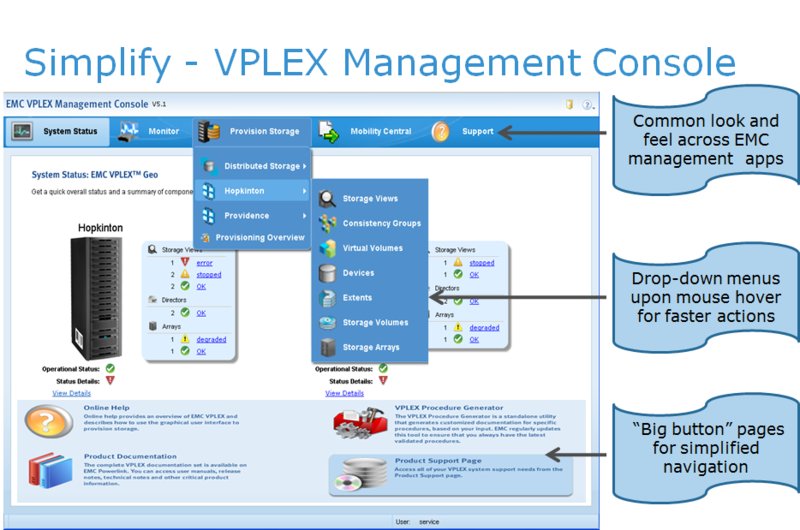 VPLEX offers a complete set of management capabilities. 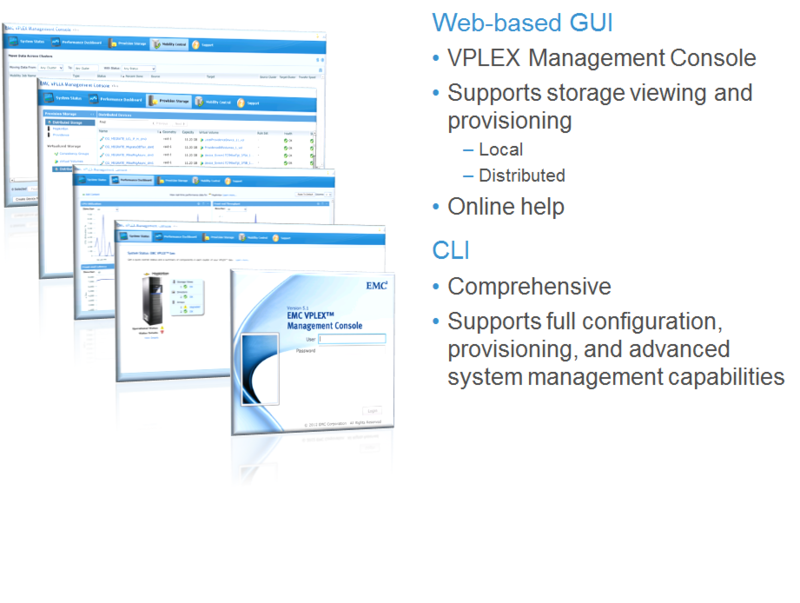 The VPLEX graphical user interface (GUI) satisfies the majority of the daily user workflows for storage provisioning and is there for additional ease of use. The command line interface (CLI) provides a comprehensive suite of virtual storage provisioning options to support all possible user workflows. Some enhancements coming in Q2-2012 include tighter alignment with EMC’s “EMC Common User Experience” look and feel across all EMC management products, making it easier and faster to move between managing different EMC products. This also significantly reduces the learning curve for IT staff. The new look and feel includes new drop down menu visibility upon mouse hover vs. actually having to click each menu selection to see what exists deeper in the menu. It also includes new “big button” pages that provide larger icons with descriptions making it easier and faster to identify what management task you need to perform. 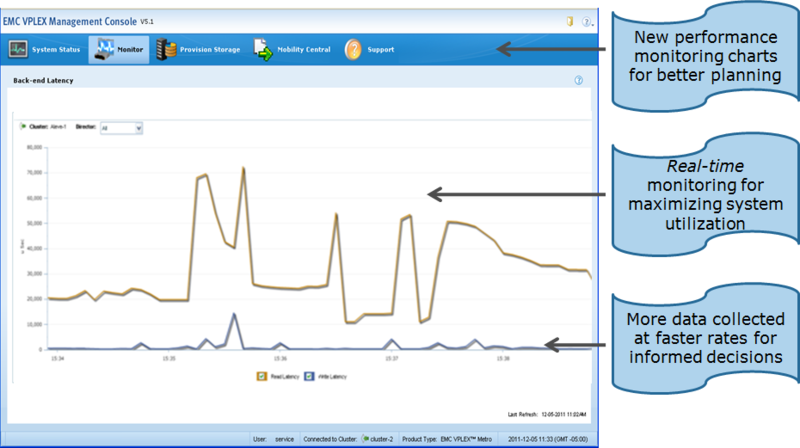 There are also a number of enhancements coming in Q2-2012 for monitoring VPLEX performance. There are several new charts along with real-time performance activity monitoring that provides five minutes of data collection that is updated at five second intervals, giving VPLEX managers even fresher data from which to make their performance tuning decisions. On the next post, I will discuss the RecoverPoint 3.5 Integration…oh man!